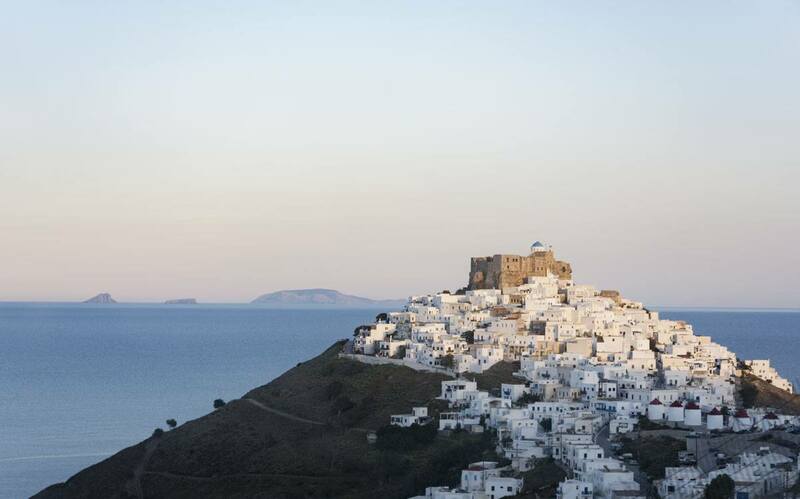 Astypalea is a little drop of heaven in the middle of the Aegean Sea. We’re going to Astypalea. Asty-what? Never heard of that – where is it? 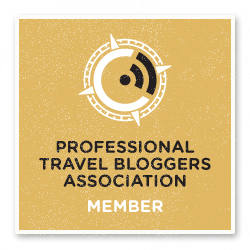 That was – by far – the most common reply when we told our friends about our trip to a Greek island in the southern Aegean. That was kind of bizarre. We live in Italy, and Italians are crazy about Greece. 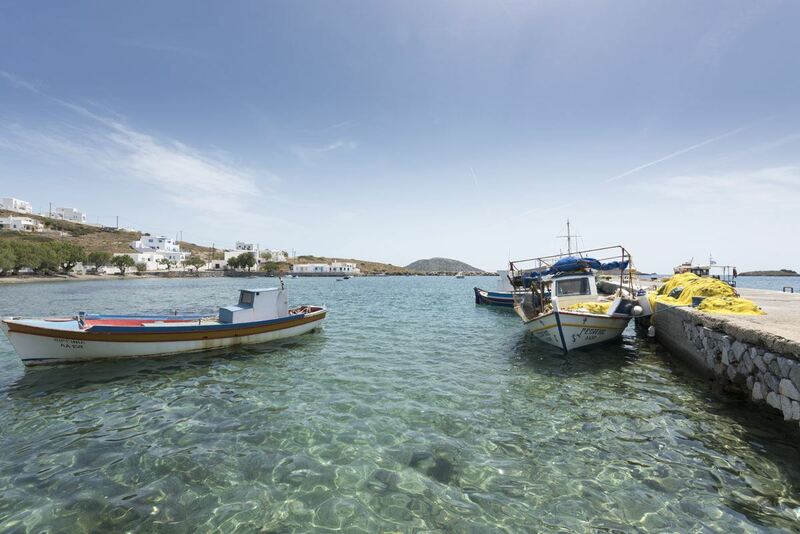 Not just Crete, Rhodes, Santorini and the like – I know some Greece aficionados that have spent years island-hopping, covering not just the big-name islands, but also lesser-known ones such as Kastellorizo, Folegandros, Nisyros and Amorgos. Yet, not a single person had ever heard of Astypalea. 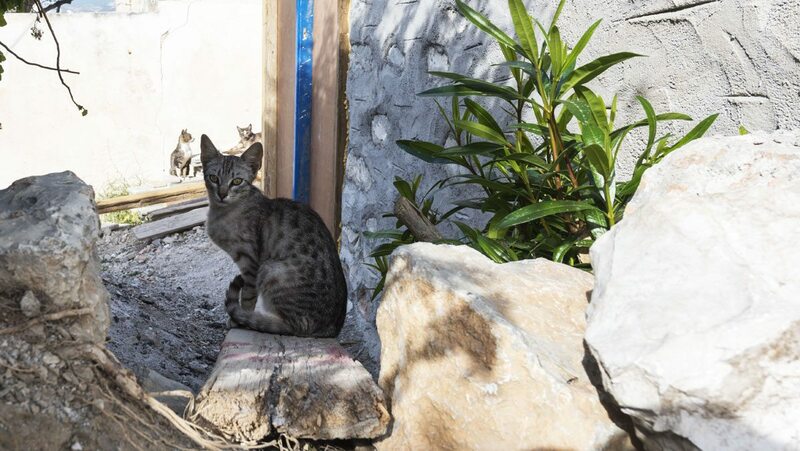 Then we travelled to Athens, and asked locals and travellers we met at our favourite hostel Athenstyle about Astypalea – the response was largely the same. 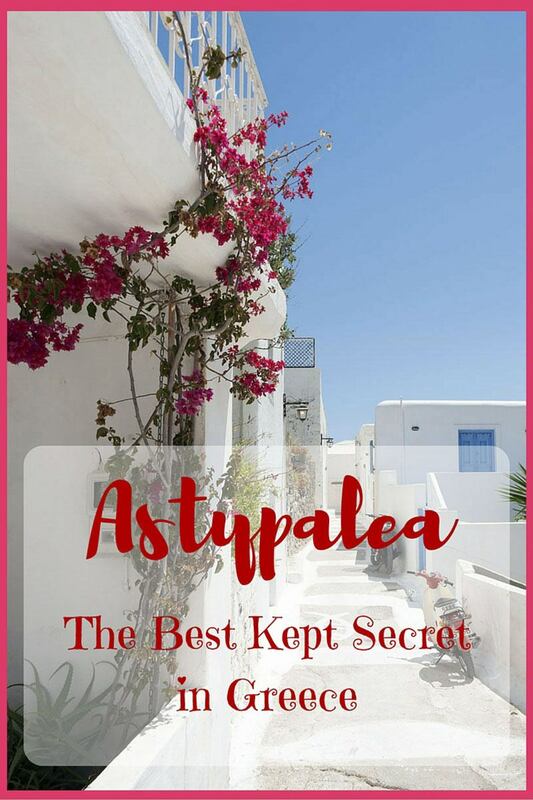 Some had vaguely heard of Astypalea – had kind of an idea of where it was and knew of it because of its delicious cheese and rakomelo, the local firewater mixed with honey. 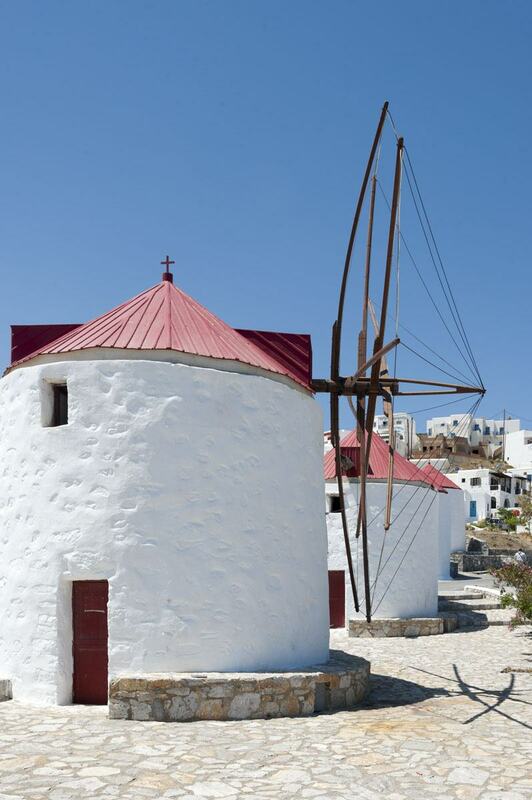 Astypalea is, indeed, in the middle of the Aegean sea. It’s over an hour sailing away from the nearest islands, Kos and Amorgos. The island is named after a beautiful nymph, that Poseidon had fallen in love with. The nymph turned into a fish-tailed leopard to elude the god, but he managed to find her, and abduct her. And then, what happened? Was the nymph turned from a leopard into a butterfly, and laid out its wings, resting in this secret corner of the Aegean sea? 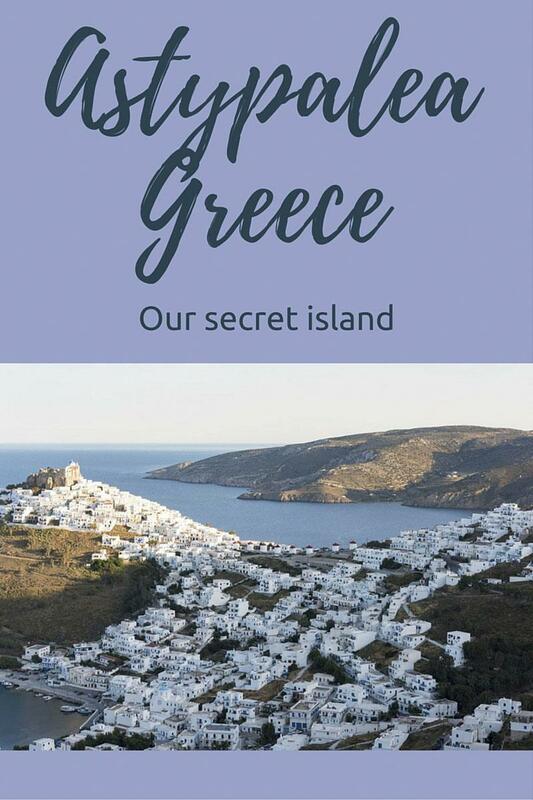 For the island is, indeed, shaped like a butterfly – but legends surrounding its name and origin are shrouded in mystery, lost beneath the whitewashed houses of Chora, or carried by the wind beyond the foam-topped wavelets lapping at Astypalea’s cliffs and beaches. 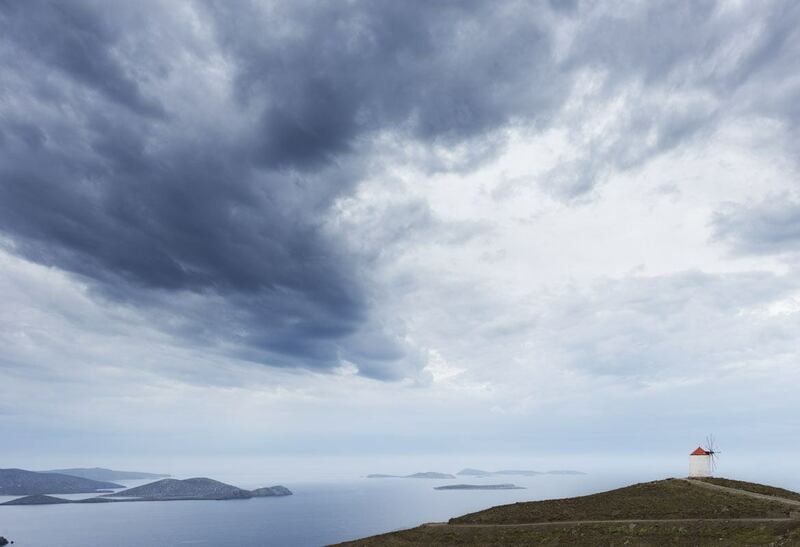 Sailing to Astypalea feels like travelling to the end of the world. The island is only 117 nautical miles from Athens – that doesn’t sound like a lot, but trust me, our ferry set sail from Piraeus at 5 pm and didn’t reach the island until the early hours of the following morning. We stopped at various other islands, where passengers disembarked one by one, carrying food for the upcoming Easter celebration and their pet cats in cute little carriers. With every stop, it was as if we shed a layer of ‘earthliness’ and entered the realm of the spiritual and mysterious, like Dante during its climb through Purgatory. 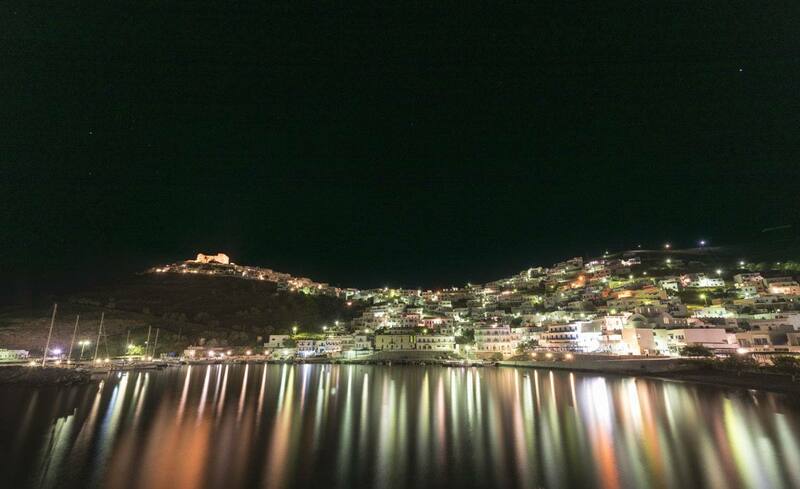 We docked at Astypalea under a starry sky. A single streetlamp lit the small harbour, set in one of the coves between the two ‘butterfly wings’. 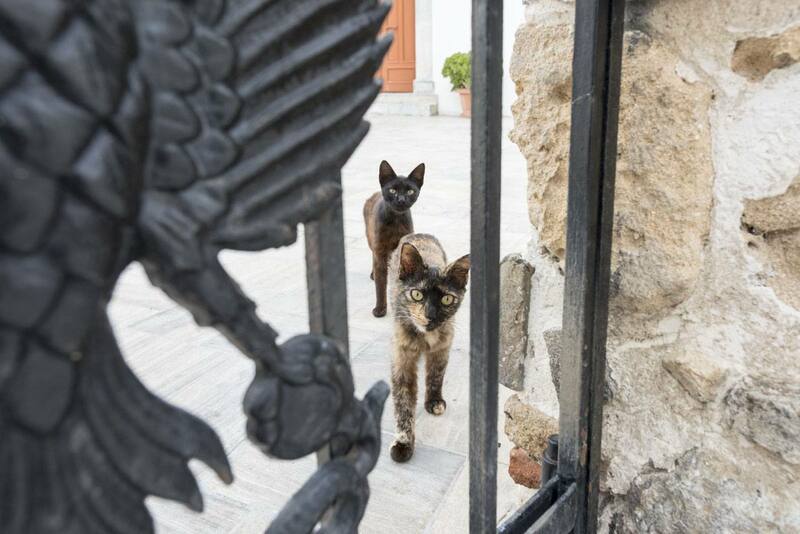 We had reached the end of the line, and were ready to explore this ‘little drop of heaven’, a secret island where mysteries are as common as the cats ambling between the cracked pavement stones of Chora, the island’s largest settlement. 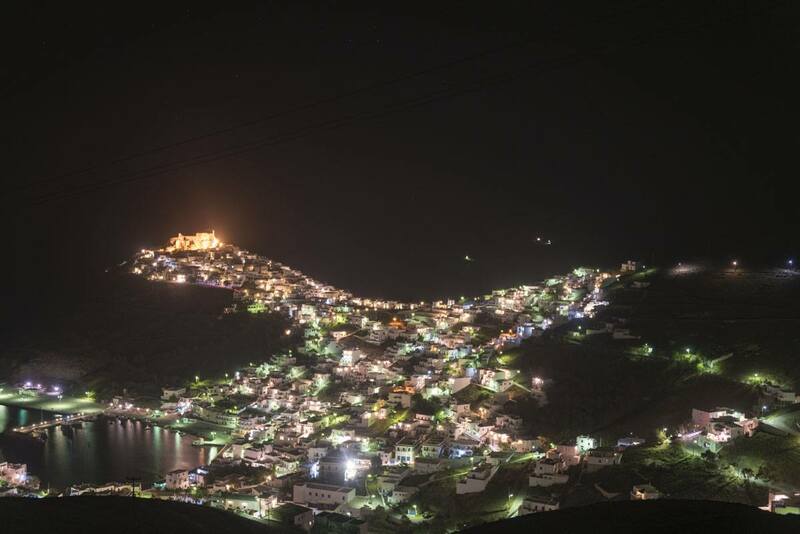 Astypalea possesses a strange kind of energy. If you’re familiar with the theory of ley lines, you’ll know what I mean. Some places around the world are pervaded by a kind of magnetic force, too deep-set to be manmade, too volatile to be traced back to a specific source. 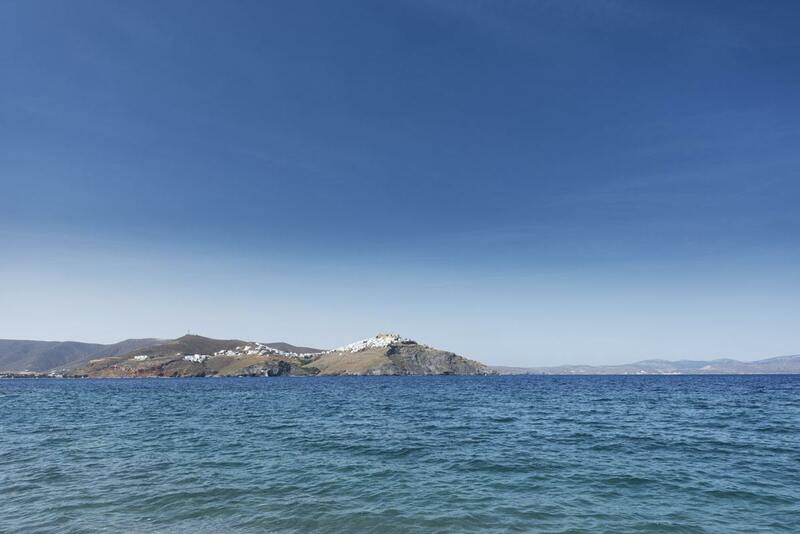 Several Greek islands are said to have a strong energetic presence – unstoppable Aphrodite, our guide, described her home island Mykonos as ‘a place where even 3 or 4 hours of sleep make you feel well rested’. 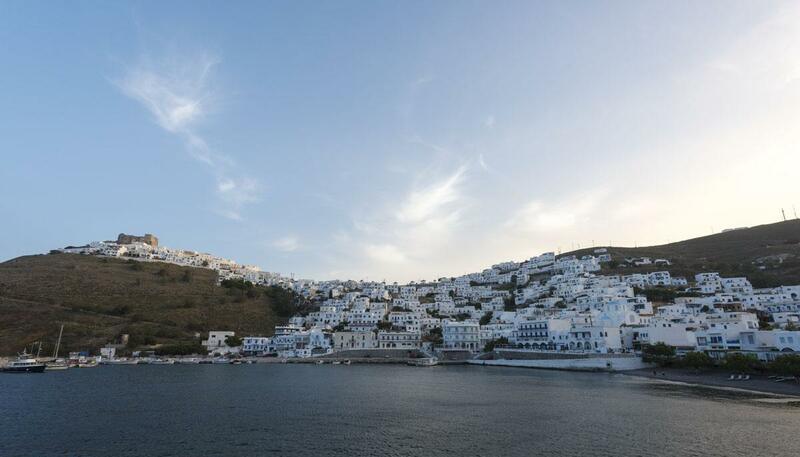 Astypalea is a place that makes you feel well. And that goes beyond the ‘simple island life’ paradigm. 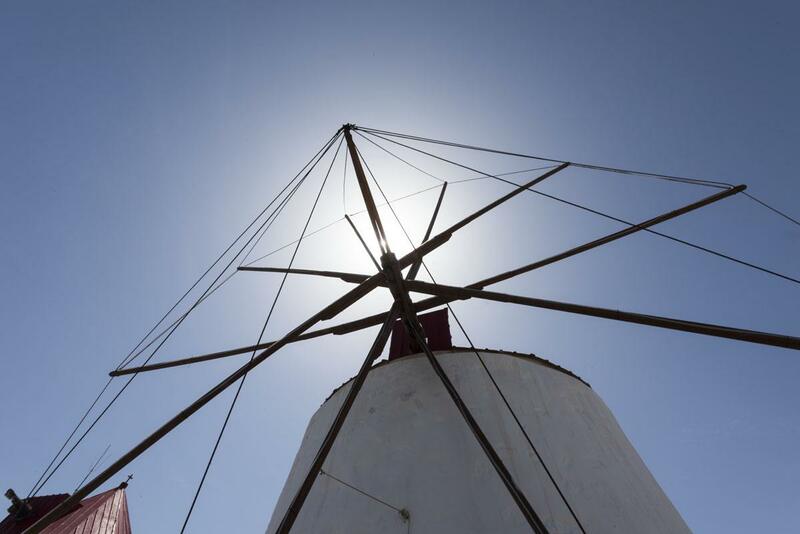 The energy of Astypalea is in its people, their hospitality and friendly smiles that accompanied every minute of our five-day stay. 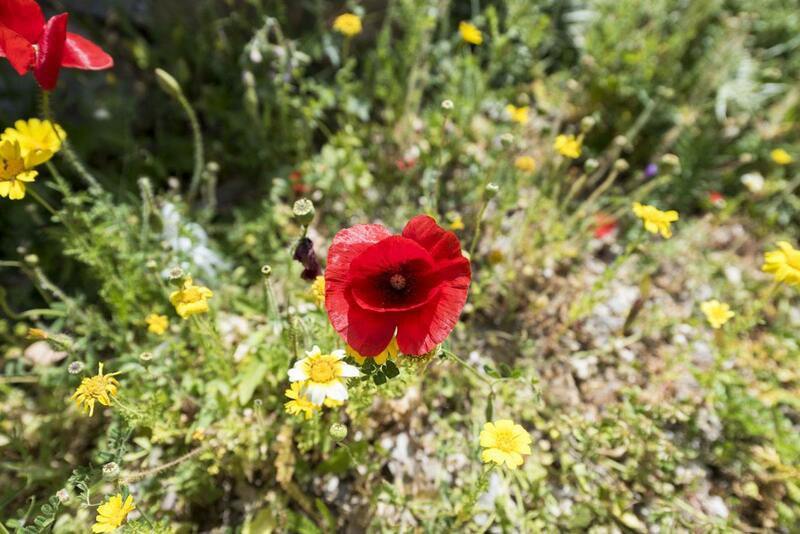 It’s in the soil, one of the most fertile in the Greek islands. It’s in the wind, carrying the scents of sea and wild herbs. It’s in the sea and the sky, both of them a blue so deep that almost hurts your eyes. 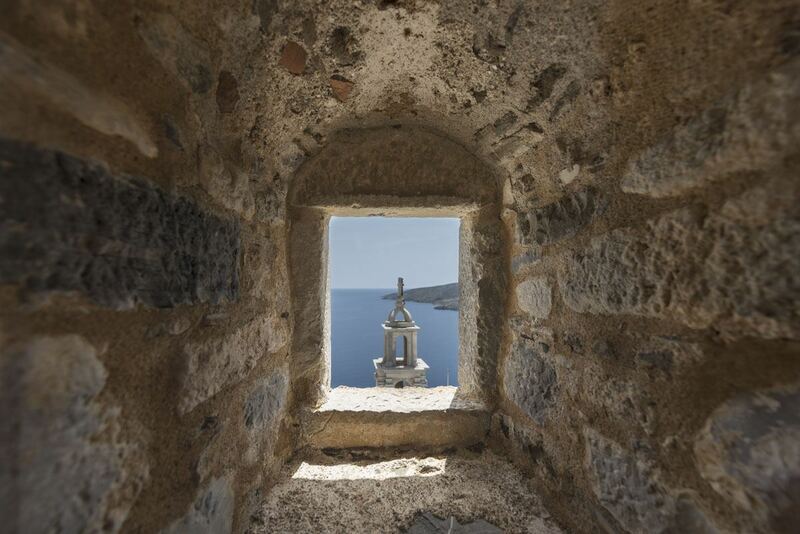 The place where we felt Astypalea’s energy at its most intense was Chora. 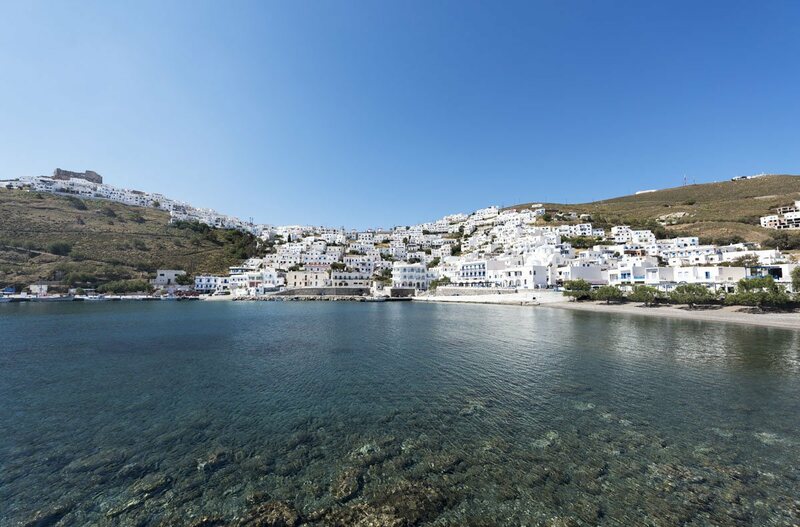 Several Greek islands have their own Chora – the word can be translated as ‘village’, and it is used to describe the main settlement on an island. 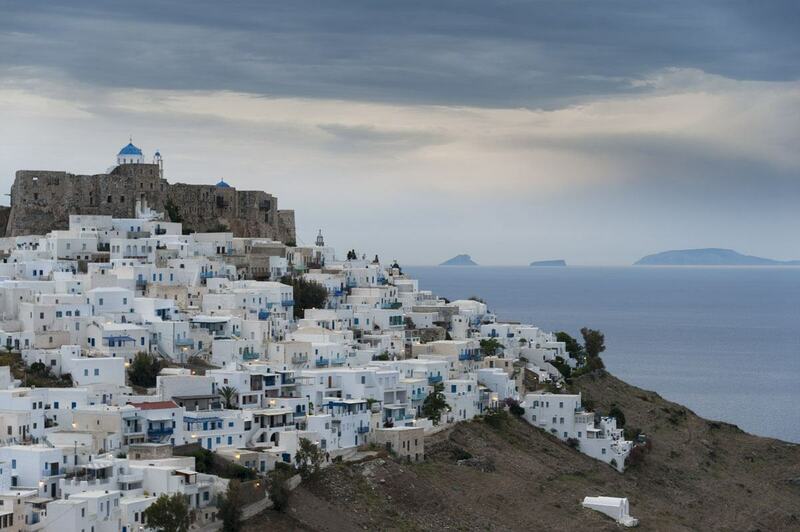 Astypalea’s Chora is one of the most scenic in the whole of Greece, hundreds of cube-shaped white houses packed together on a hillside around the Castro, the ruined castle overlooking the island. 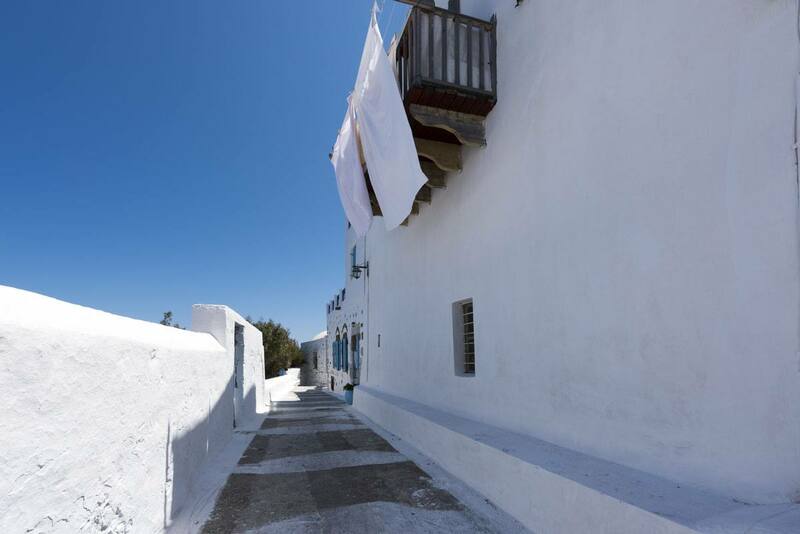 From afar, the houses of Chora look like a cascade of white paint dripping from the hilltop all the way to the old port, too small nowadays for the huge ferries sailing from Athens. 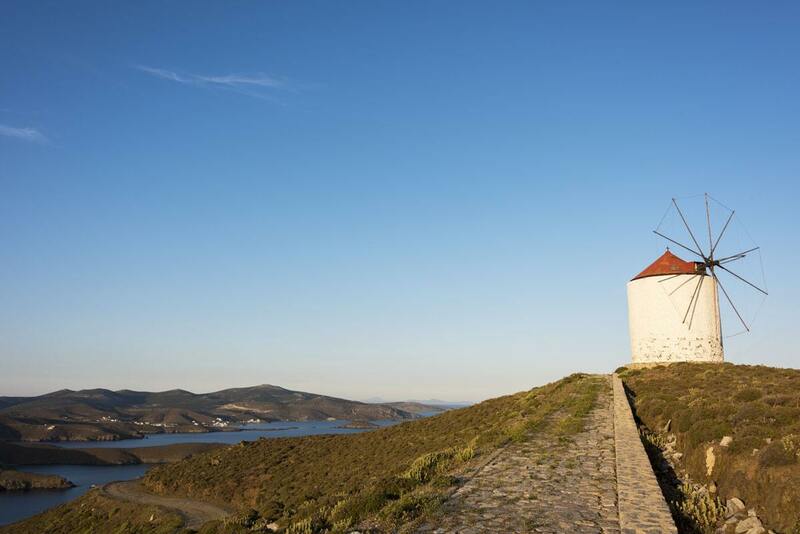 Seven windmills stand guard on the main square at the entrance of the town, seven giant sentinels of Quixotian memory, surrounded by the blue of sky and sea. 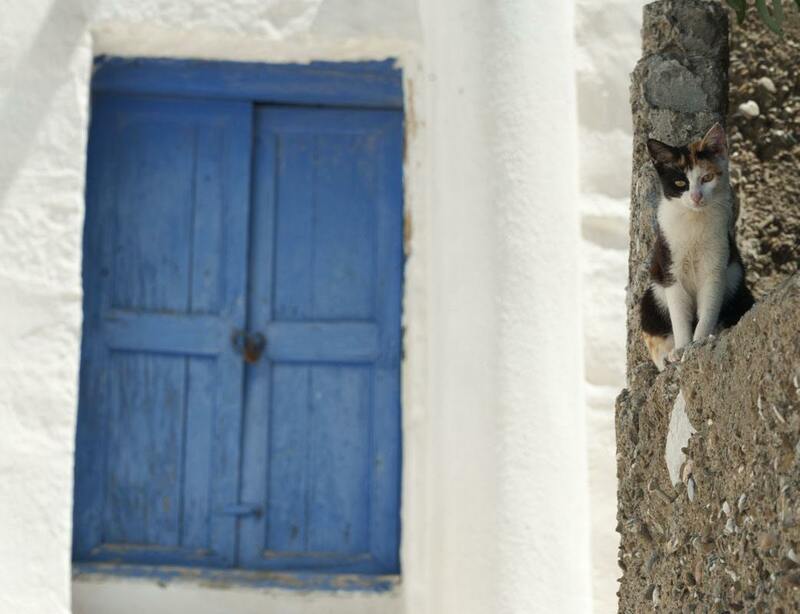 We spent a morning walking around Chora, following the cats that wander freely in the streets snaking uphill towards the Castro. 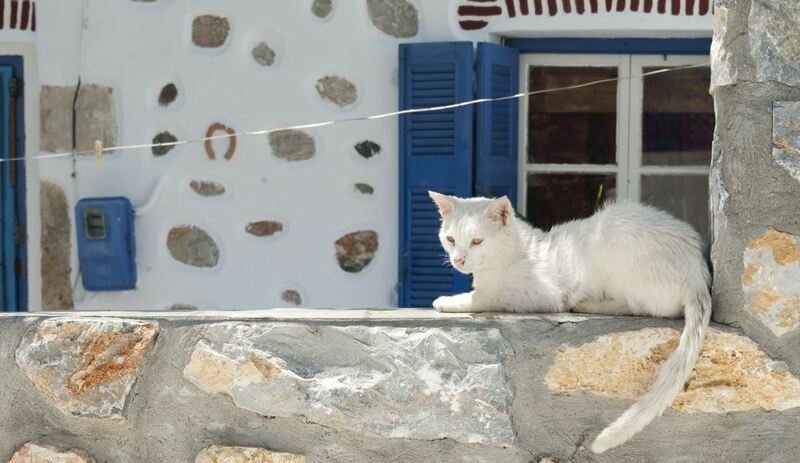 We followed a scruffy black and white tuxedo cat up to a whitewashed cemetery on a terrace over the sea. The blue of sky and sea gradually faded as our gaze neared the horizon, where other islands and islets appeared as if they were floating. The gravestones revealed that most people had lived a long life. We lost the tuxedo cat but found a skinny tabby, looking like an Egyptian hieroglyph, and followed his footsteps instead. 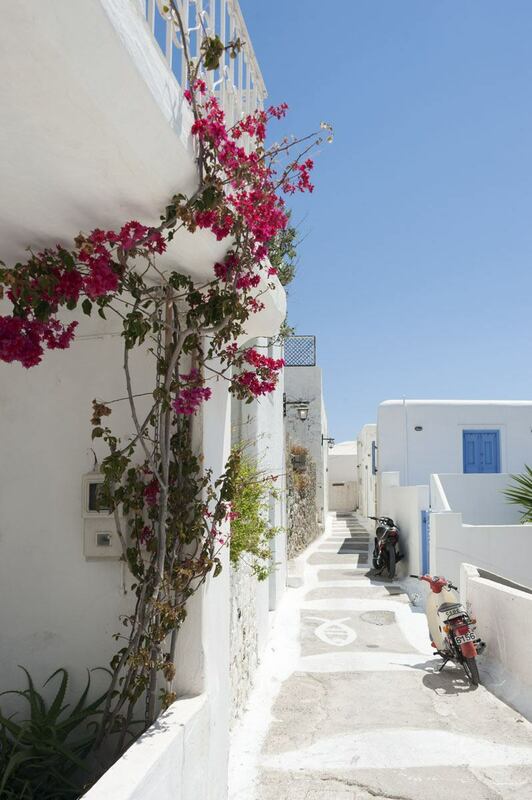 He led us to a courtyard with a purple bougainvillea and a single poppy growing in a crack between two steps. The wind ruffled the poppy’s tissue-paper petals. A patched white and orange cat ran downwards, up towards the Castro. We heard chatter and the smell of fried garlic coming from open windows on the way – lunchtime was approaching. Chora didn’t have the prettied-up appearance of more famous Greek islands, with souvenirs and faux-hippie stores. Paint was sometimes scratched. Paving stones uneven. Some flowers were in full bloom, others were wizened and dried on their stems. Cats bore battle scars. In the streets of Chora, we saw life. Not a magazine-polished version of life, specially manicured to reinforce stereotypes. Real life, perfect with its uncertainties and imperfections. Around Chora, all roads lead to the Castro, sitting atop the hill like a crown, impenetrable with its grey limestone walls. Chora looks as old as time, but was mostly built in the Twentieth century – before then, Astypalea’s denizens lived behind the walls of the Castro, that could shelter up to 4000 people at full capacity. 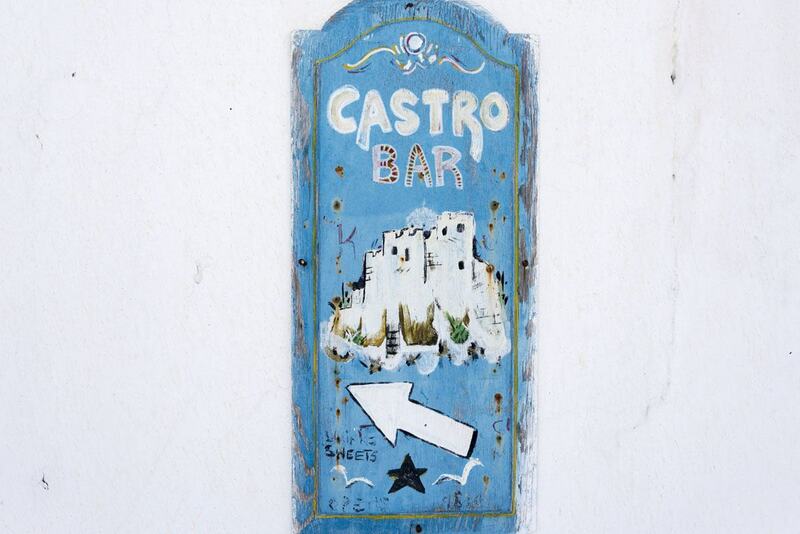 A single door leads into the Castro, under the thick walls that have protected the island from countless invasions. Due to its isolation, the island was raided by pirates countless times throughout history – the village of Analipsi near the harbour is locally-known as Maltezana, in reference to Maltese pirates, as that is where they landed. 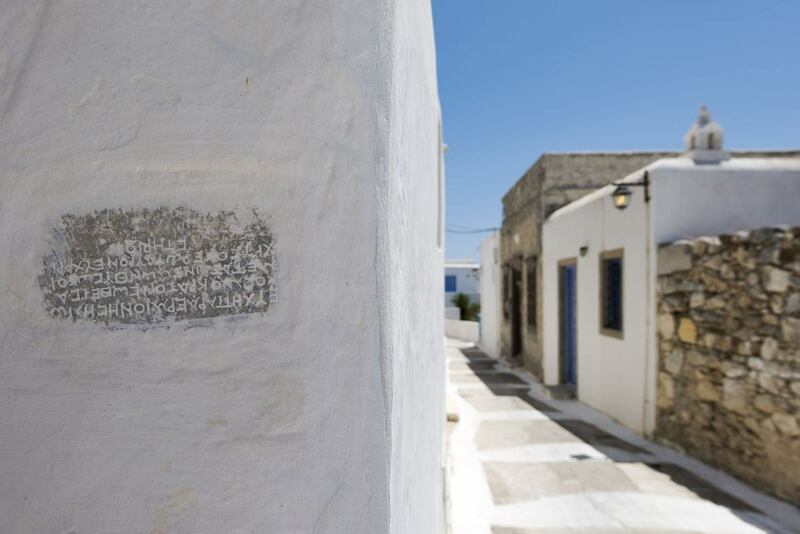 Astypalea, Stampalia, Istanbulya – the layers of history have left their mark on the island. The Castro is where it all comes alive. First of all, the Venetians came, snatching the island from Byzantine hands on the way back from one of the crusades. The island was ruled by the Querini, a noble Venetian family that built the Castro in the 15th century. 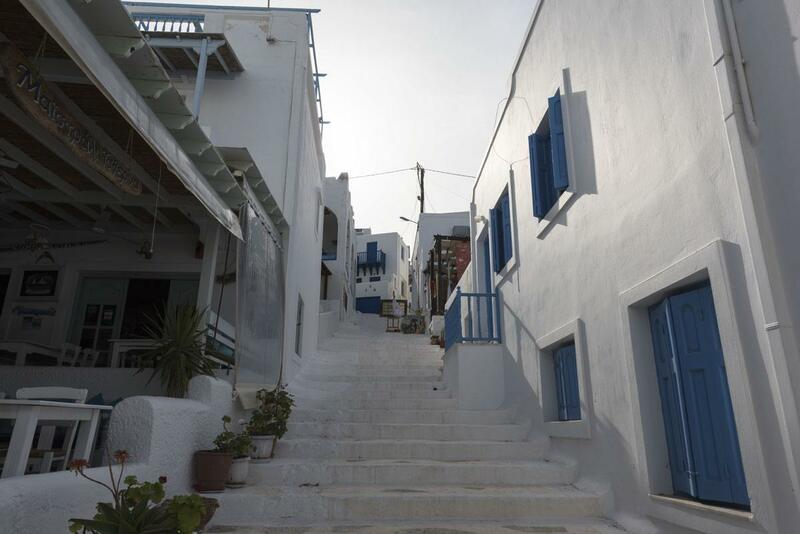 The relation between the Querini and Astypalea was so strong, that the family decided to add Stampalia – the Italian name of the island – to their family name. Palazzo Querini Stampalia is now a beautiful museum in Venice. After the Venetians, the Ottoman Turks arrived, ruling the island for the best part of 400 years and renaming it Istanbulya. Within the Castro walls, the Sarayi tower survives, an Ottoman-built watchtower. Then, the Italians briefly retook the island in 1912, before it finally became part of Greece after WW2. Few buildings survive within the Castro walls. Stone walls and the shells of houses, windows looking out to sea, looking out at the coastline and the islands suspended between sea and sky. Framing Nature’s masterpieces. 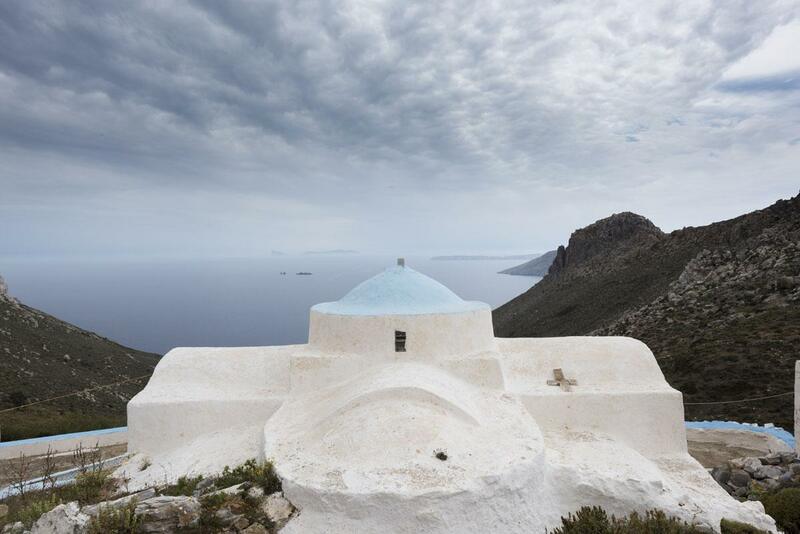 There are two churches, Panagia and Agios Georgios, whitewashed and blue-domed in stark contrast with the grey castle walls and the barren land with dried weeds. The rest of the Castro was destroyed by an earthquake in 1956, creating a tsunami that swept five centuries of history into the sea. Many more mysteries survive – and one of them is just a short walk away, in a patch of land right where the town ends, and the cliff begins. Can you spot the Castro on the top? In 1995, excavations started for the foundations of houses on the eastern side of Chora. Archaeological findings in construction sites are hardly news in Greece – dig a little and you’ll find houses, temples, all kinds of artifacts. Yet, nothing could prepare Astypalea locals for what was beneath the ground. The grounds were strewn with amphorae, each containing foetuses or bodies of babies up to two years of age. It was an infant cemetery, the only one in the world, the origins of which are lost between centuries of history and Mediterranean legends. 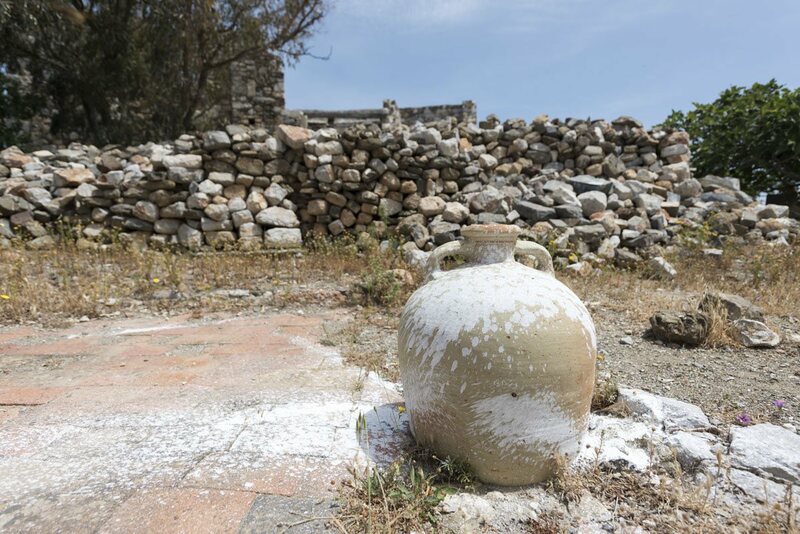 An Oxford researcher and his team have been visiting the island for over twenty years, digging, carbon-dating and trying to unveil the mysteries behind Astypalea’s infant cemetery. This patch of land, with weeds sprouting out of dried, cracked soil, strewn with plastic bottles and assorted rubbish, was once holy. Nearby, there were the temples of Artemis, goddess of hunting and of the moon, and protectress of women, and Illythia, goddess of childbirth and midwifery. The babies were buried over a period of a few centuries, in the 1st millennium BC. There are thousands and thousands of amphorae, coming from every corner of the Mediterranean, from as far afield as Phoenicia, Egypt and Italy. It seemed that the infant cemetery of Astypalea was a pilgrimage destination for wealthy families that lost a baby. Burying their dead baby, mothers hoped to close a circle, delivering the tiny soul to the two goddesses, in the hope of having it returned, healthy this time. There’s not much to see in the infant cemetery. It’s all boarded up, and excavation is very much a work in progress. This is an evocative place, like many on the island. A place where history, lives, legends and death have intersected, mixed and crossed over centuries, leaving a trace. Call it energy. Call it magnetic field. Call it whatever you like – but you’ll agree with me. 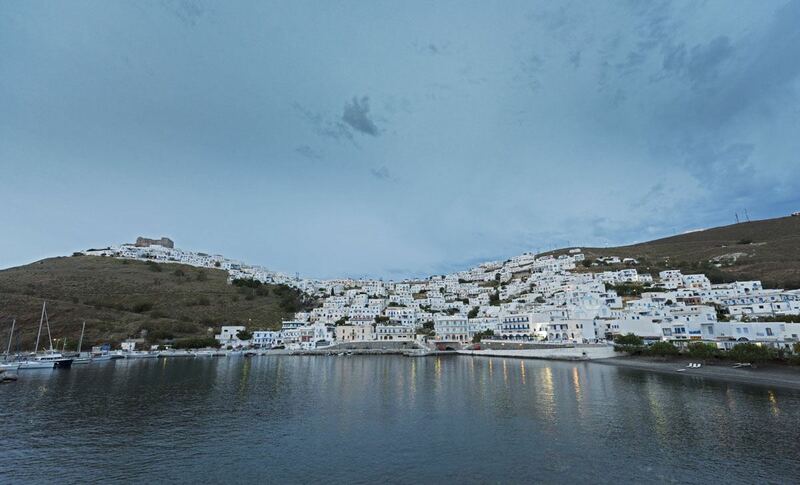 Astypalea will bewitch you. It will charm you. 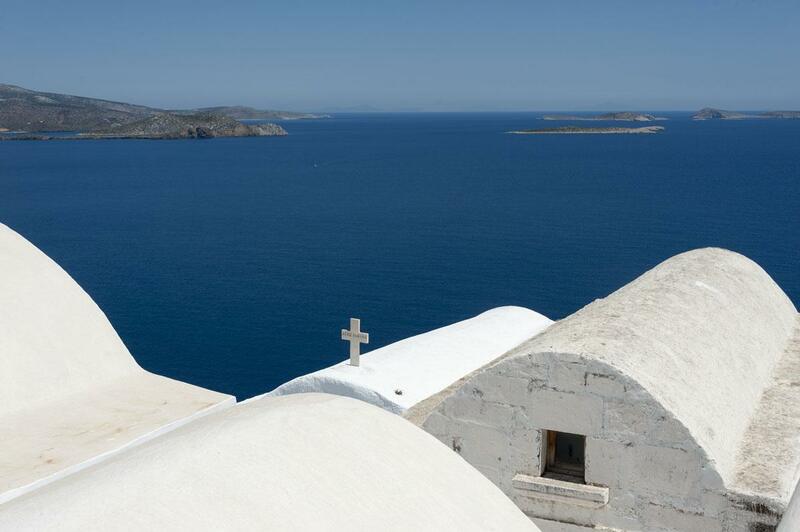 And when you leave, a little of this little drop of heaven in the middle of the Aegean sea will stay with you. By Ferry: the cheapest way to travel to and from Astypalea is by ferry. 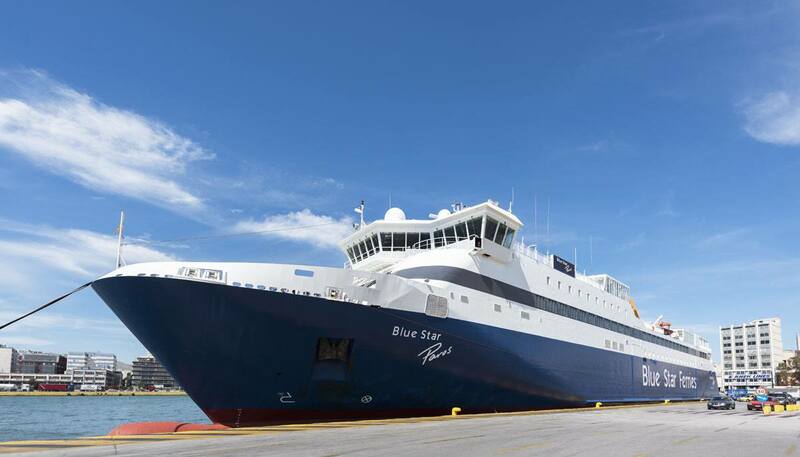 Ferry times vary between seasons – check Blue Star Ferries for the latest timetables and fares. 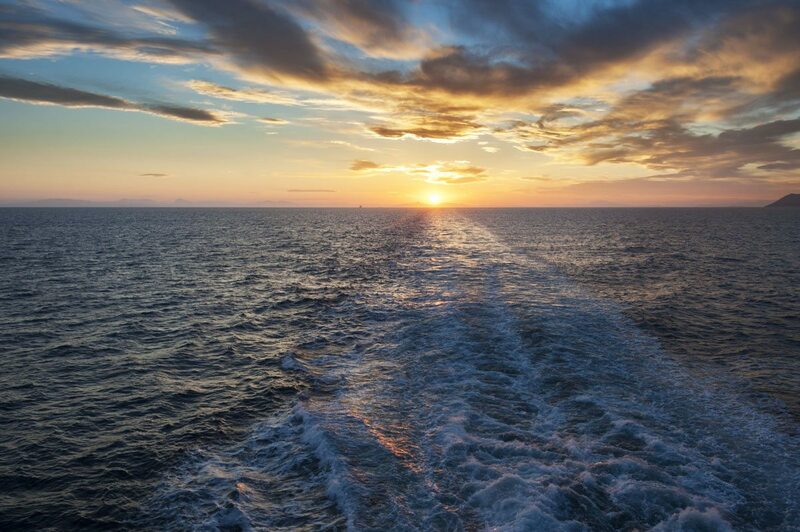 Expect to take around 10 hours and pay about €30 for a deck ticket and from €65 onwards for a cabin. By Plane: Olympic Air flies from Athens to Astypalea almost every day. 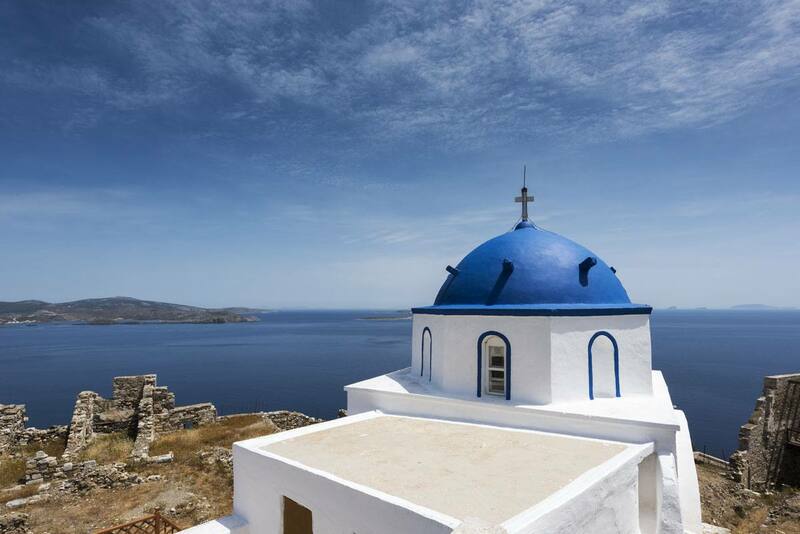 You can book directly on the Olympic Air or Aegean Airlines site. The flight takes one hour and costs about €180 return. Most hotels and apartments will offer transfer from the airport/ferry, either included in your room price or for small extra. If you just want to explore Chora, the castle and surroundings you won’t need a car – but if you’re planning to venture further afield, do some trekking and explore the villages of Livadi and Analipsi, the beautiful beach of Agios Konstantinos and the mountains, you’ll definitely need one. 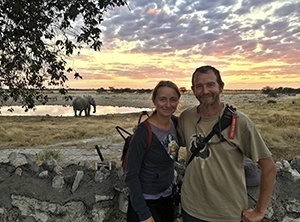 Delis Car Rental Services offers a large varieties of vehicles on offer – we opted for a Suzuki Jimny and we thought it was perfect for the unsealed roads leading up to the mountains. Please be aware that there are only a couple of petrol stations in Chora, and they close for lunch and on Sunday. If you don’t want to rent a car, you can get in touch with Roussetos from Elementi Travel Agency, who offers transfers and tours around the island. 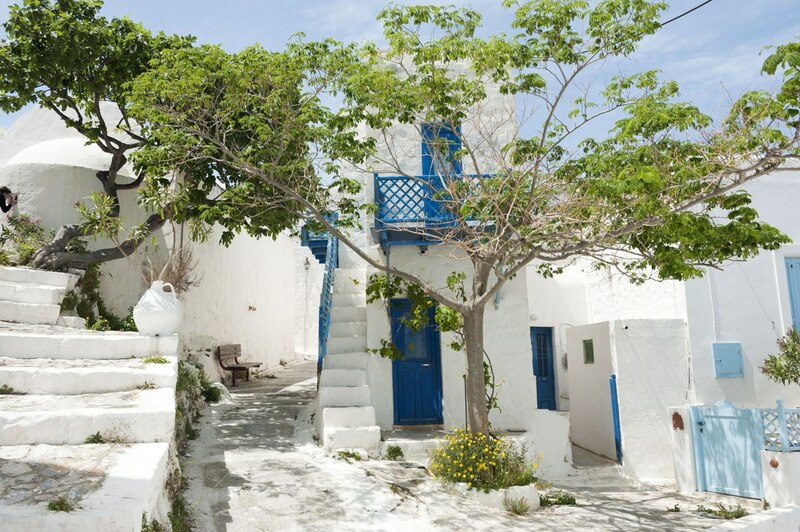 There are no big-name hotels in Astypalea, only small, family owned apartments and boutique hotels. We stayed at Vythos Apartments, run by sweet Alena, a 15 minute walk away from Chora and the old port. 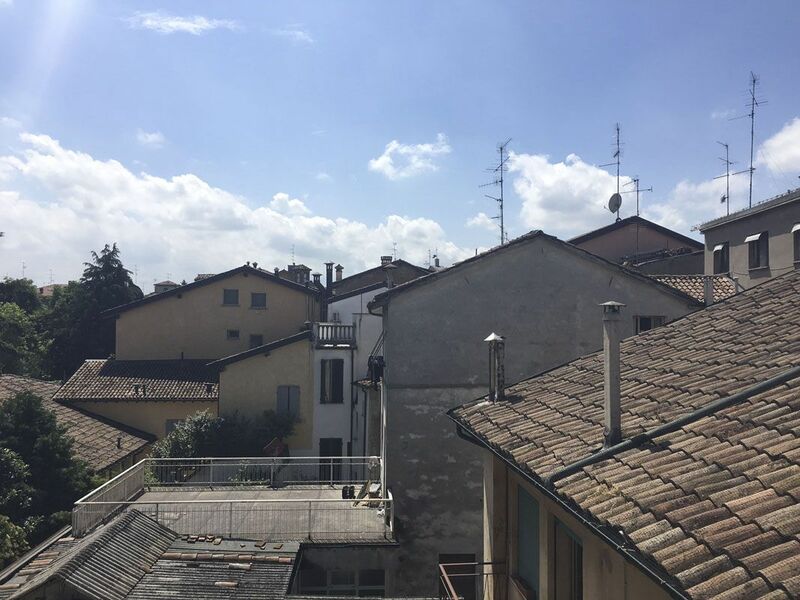 We had our very own little apartment complete with kitchen and fridge, and a lovely terrace with THIS VIEW. I must say, I’ll miss waking up to that every day! 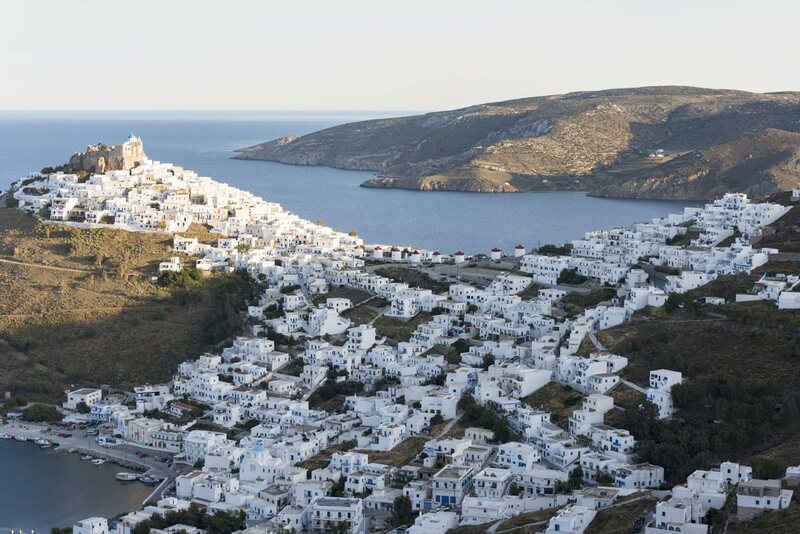 If you fancy staying closer to Chora, opt for Kallichoron, an art boutique hotel said to have the best breakfasts in Astypalea, or Andromeda Resort, situated higher up from the town, but with views to die for. 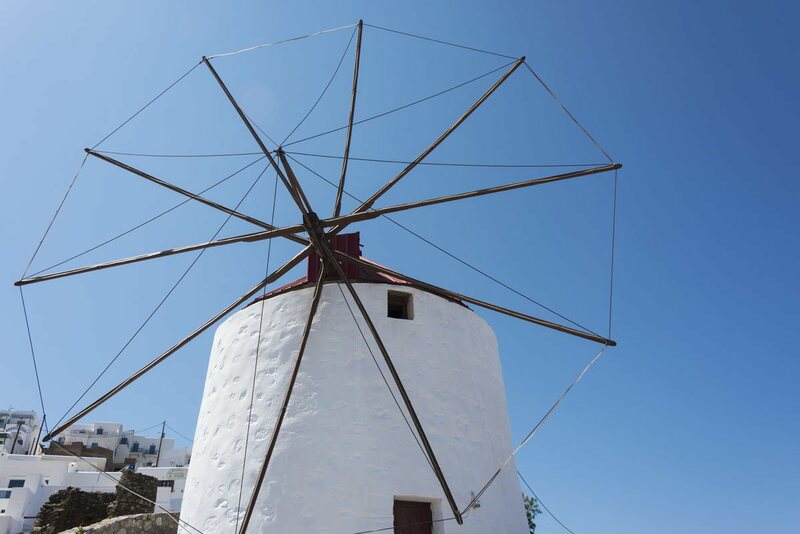 Agoni Grammi – located in Chora’s ‘Windmill Square’ and run by friendly Maroula, this restaurant offers Greek specialties including delicious skordalia and taramasalata, Greek salad with foraged greens and also pasta and pizza. Astropelos Café Restaurant – this restaurant is in Livadi, a short drive from Chora. Owner Maria serves a creative menu that includes salads, Greek traditional dishes and some great seafood. I’m still drooling over the stuffed squid and lobster spaghetti we had! Barbarossa – in the heart of Chora, Barbarossa is where we had our vegan Good Friday lunch (even though we did have a cheeky moussaka thrown in). We had lots of dips, grilled vegetable dishes and different colourful salads. A truly great meal. We would like to thank the municipality of Astypalea for having hosted us during this media trip. All opinions are our own. Looking for more Greece posts? 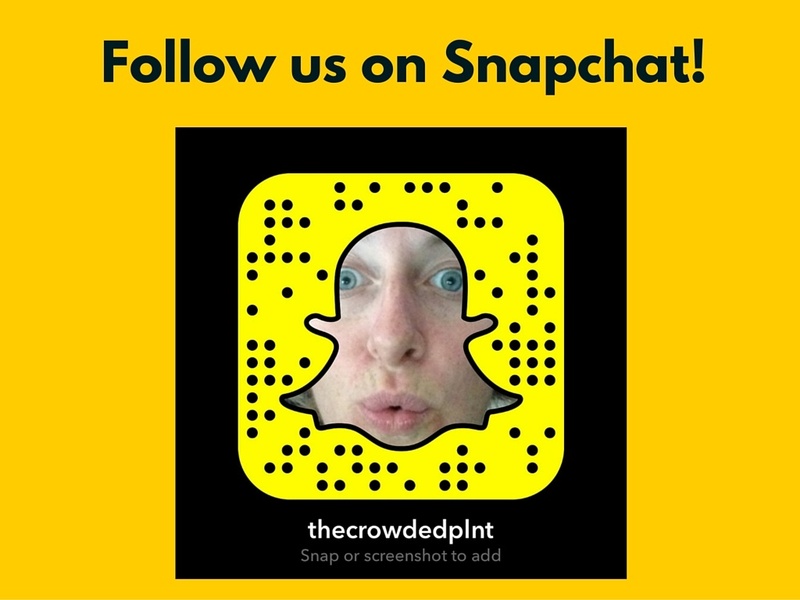 I loved every detail of the post guys, so nice to relive our moments in this special island through your words and pictures! The ferry journey was definitely worth it! Spectacular article! I read every word and savored every photo. I’ve been to Oia on Santorini, and that is the only thing I can compare this to. What can I say? Greek islands seem to be truly amazing! Omg! What a wonderful secret to share! Loved all the legends you included, the details and all the amazing pictures! Hi there…..I spent two and a half months on Astypaleia last year ; mid August to end October . Spent entire time with Nikolas and Maria and their wonderful family at Anixi Studios in Livadi. Had wonderful time with kind and friendly hosts! 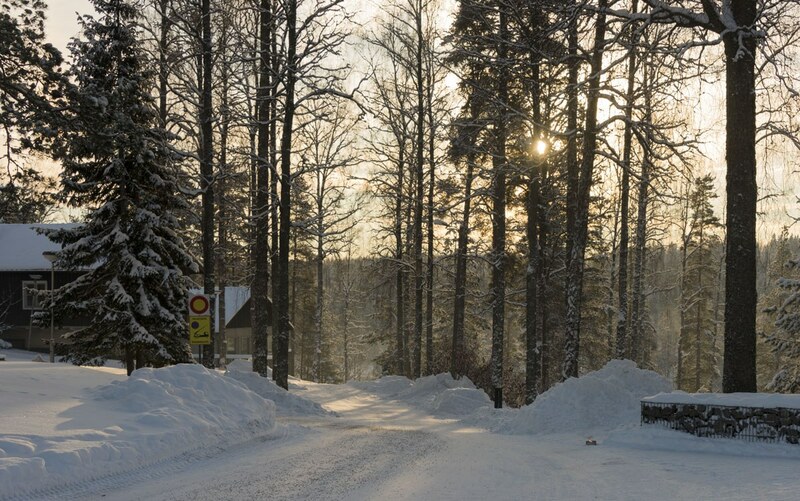 I hope to return next year….. Sounds great! 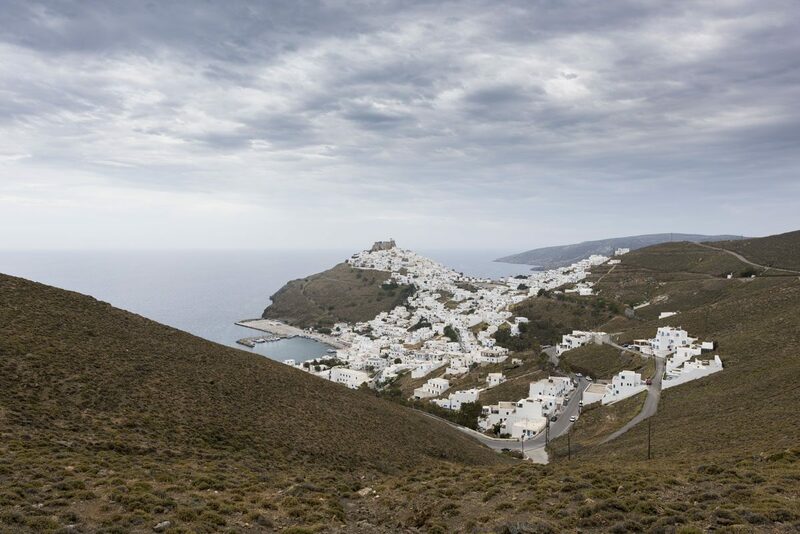 Astypalea is a lovely place to disconnect for a while… we are also hoping to return!